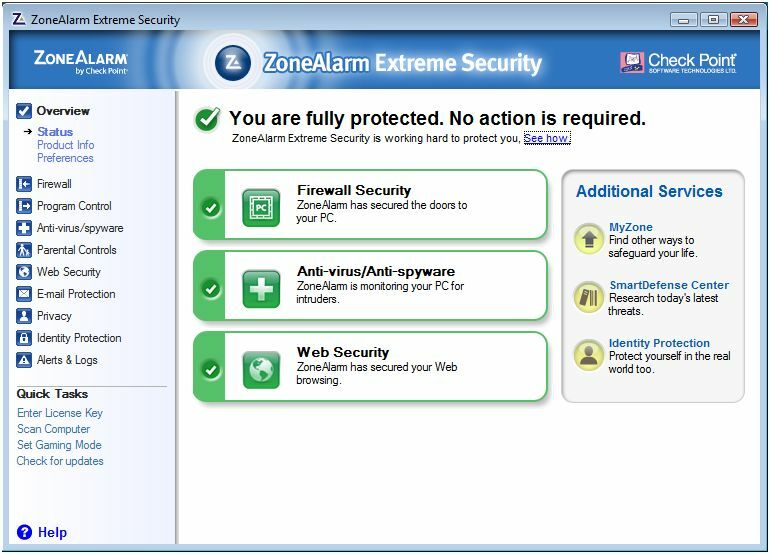 ZoneAlarm Extreme Security beta !! Discussion in 'other firewalls' started by stargate2k, Jun 7, 2008.
there is a new beta out from zonelabs, called "ZoneAlarm Extreme Security"
Really nice feature set indeed! Looks like the Suite has finally been upgraded for Vista and ForceField is packaged with it. Interesting. Unfortunately without any renovation, just a classical feature-rich security suite. But... unlike other security suites currently available, the new ZoneAlarm suite has the potential to be a unique true all-in-one solution, without the need to get additional security software. If they play it right, they've got an even more feature complete suite then all other suites currently available. All the needed layers of protection will be available in one package. I will certainly keep an eye on the progress of ZoneAlarm. On a side note, I don't quite understand why this thread is in the "firewall" section of Wilders. Yes, but you are looking for an all-in-one solution, while other users want separate softwares, which has been discussed already so many times. I had these all-in-one solutions already in my head, before they even existed. In the beginning they created simple security suites : FW + AV + AS and it was very logical that the existing simple security suites would be expanded with other features in the future. Every company with a security suite will do that and ZoneAlarm is just one of them and there is always a first one. Look at the feature list and there is nothing NEW. Each feature has been invented already, more than once under a different software name. I'm not waiting for a repetition, I'm waiting for a renovation. I wonder if they have eliminated the need to disable half the features in order to make it work. That was my experience with ZASS, and one of the reasons I eventually had to dump it. Interesting. I went with ZoneAlarm AntiVirus since half the features in ZASS were missing in the Vista version. To the best of my recollection after a few years, the AV wouldn't update, the e-mail checker didn't work, and the Anti spyware wasn't very good. That aside, each upgrade was like Russian roulette, in that sometimes you got a good one, but eventually your luck would run out and you would get a bug ridden upgrade that would bring your computer to its knees. I found that choosing my own apps, is the best solution rather than a suite. It's true that all the features are not new. It's also true that just about all the security vendors currently on the market keep reinventing the wheel. And if you mean by "renovation" = innovation, then I agree with you. But true innovation is a rare thing in any market, including security software. To come up with something completely different, something that's radically new, something that has never been done before... that's a real challenge. At the moment I think for the time being the only progress in the near future we will see in the security market is the simplification of currently available technologies and especially HIPS technology, which in it's current form is not ready for the majority of the market because of it's complexness. But if ZoneAlarm is going to be the first security vendor that incorporates all the major defense layers into one package, then I can only praise them for doing so. Because this will force other security vendors too be more innovative as well and eventually come up with something completely new. OK with "innovation", not really good at English. Hopefully, ZoneAlarm is not too heavy and that each feature can be enabled or disabled. It won't be my personal choice. Hopefully,ZoneAlarm is not too heavy and that each feature can be enabled or disabled. It won't be my personal choice. i think ZA has a very good firewall and with kaspersky a very good antvirus protection.. and in combination with forcefield, it is a realy good security suite. the new 7.3 version brings all ZA products on the same level and there is no more different between vista and xp. so i think that later in this year the 7.5 version appears with new features. Have you taken a look at the latest version of KIS; just about to be released? It has everything that you listed in your first post except for the sandboxing, although the inclusion of that sort of functionality was discussed very early on in the beta process but not progressed. So ZAES is not that innovative in terms of the bundled functions but it will be interesting to see how well all the function works all together as the product matures. Especially in resource utilisation and performance. I used to run ZASS but dropped it due to resource hogging and other wrinkles. This release just confirms the trend I think for the ever increasing functionality incorporated into suites. Yeah the new KIS seems like a real nice suite indeed, to bad they dropped the sandboxing features. Maybe they will add it in some future update, because I think it would be a real nice addition to KIS. I don't think it was droppoed but rather considered but not taken up at this stage as there was already so much new in the new version that it was felt that this might be one step too far...which I think was wise. I am sure that it will be reconsidered re. future releases...especially now that ZAES incorporates that functionality. I shall watch ZAES's development with interest. I have to agree. Innovation is overrated. It doesn't make sense for a mature company like checkpoint to 'innovate' by plowing R&D money into risky technologies. They can buy out new technologies if they wanted to. Just as they did Zone Labs back in 2003..... for $205 million. Glad that reference was picked up. Just to add to what I said, companies like checkpoint should be concentrating on 'execution' i.e. getting the software to market and supporting it. Has anyone has any good experienced with ZES? Running the Extreme beta on VISTA... working fine (so far). Clean install with no other security tools. Boot-up time its fine, seems to run basically light on the system (i.e. no slowdown). Yet too early to judge if it is stable. As first beta looks promising!